The Cleveland Movie Blog: The 2012 CWRU Sci Fi Marathon F.A.Q. The 2012 CWRU Sci Fi Marathon F.A.Q. Q: Why in the world should I sit through 30-odd hours of sci-fi movies in Strosacker Auditorium in January? You think I'm nuts? A: Well, yes. You've been drawn to science-fiction's stimulating concepts and fantastic horizons since childhood, elevating you above the mundanes of society. While it means you lead a rich inner life, the consequence of your nonconformity is that you are likely an alienated loner or outright social pariah and permanent, dateless resident of your parent's basement. Only the CWRU Sci Fi Marathon surrounds you with like-minded individuals (some in their Starfleet outfits) absorbing hours of brain-blasting images, shouting Mystery Science Theater wisecracks at the lame movies, and cheering on their favorites, until, having traversed and transcended time and space, you all stagger towards the exits, exhausted but secure in having shared an unforgettable collective mind-meld with your brethren, your soulmates. Most of whom still won't answer your calls or e-mails afterwards because they've got that new "Lost" or "Battlestar Galactica" Blu-Ray boxed set to watch. Q: Okay, sold. How much to get in? A: Admission is $30, with tickets - and admission-passes in the form of concert-like wrist bracelets - going on sale at 6 p.m. in the Strosacker lobby. If just some individual movies appeal to you, like Universal's 1999 THE MUMMY reboot at 4:30 a.m. in the morning, then it's just $4 per feature. A $30 all-access wrist bracelet can be purchased at any point. Know that because of occasional R-rated fare, or just because this whole thing sets a bad example for impressionable children, under-18s are admitted only with parents or guardians. Q: When does this thing take place? A: Now in its 37th year, the Case-Western Reserve University Sci-Fi Marathon happens on Friday, Jan. 20, with the programs of features, shorts, cartoons and trailers commencing at 8 p.m. with last year's COWBOYS AND ALIENS. And, give or take changes in the schedule and all that human-error stuff that HAL-9000 got sick of, it will end in the small hours of Sunday morning, with the original JURASSIC PARK. Q: Smeg! How am I supposed to eat and sleep through all that? A: Many Marathon-goers bring sleeping bags, space allocated on a first-come-first-served basis. After a while the whole of Strosacker begins to look (and smell) like a refugee camp, or Jonestown, with bodies piled up in corners. Deodorant is now considered essential, and toothbrushes and mouthwash are recommended. As far as food, you're allowed snacks and sustenance, just no glass bottles or alcohol or hot-plate type things that could be construed as a fire hazard. Of course, there's always the coward's way out - not suicide, but you're allowed to leave and come back as many times as you have to; just hold on to your admission bracelet. Q: What other otherworldly sights might I see in the lobby or in the seats? A: That doesn't sound like a Frequently Asked Question, more like a setup. Are you a ringer? But because you ask, yes, it's not unusual for videogaming tournaments backstage, with the action in projected-digital video on the wall. And, of course, since this is a technical-college campus, don't be surprised at the wifi-ed up students going online during the Marathon, on their netbooks, handhelds, tablets or even desktop workstations. Q: What is new and different for 2012? A: In the past everything at the Marathon was on celluloid film - 16mm or 35mm, some of it rarities loaned by local collectors. Now the CWRU Film Society has a quality digital-projection setup, enabling more extensive fare. 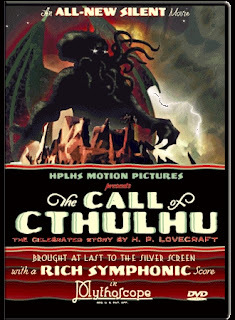 An example this year: CALL OF CTHULU, an experimental 2005 short feature by digital filmmakers imagining what an H.P. Lovecraft adaptation might be like if it were shot during Lovecraft's 1920s heyday, as Expressionist-influenced silent horror (the alien squid-god Cthulu being a stop-motion puppet). Stuff like that is often unfindable with sprocket holes. Q: What is the full schedule? A: Check out the website http://films.cwru.edu. Will any of the films be shown on 35 or 16mm? The website for the fest says, "We have also recently gained access to digital projection, a transfer we have been looking to make for a long time. We will continue to prefer print movies, but the addition of digital projection allows us access to a wider range of films that were not available before." So my guess is most of what they are showing is still on film. The addition of digital just makes it possible to show stuff like 'Call of Cthulhu' which as far as I know is only available in digital format. 1. The content never had film prints struck or film prints are no longer in circulation. 2. Existing restored digital content is of significantly higher quality than prints in circulation. 3. The content would be impossible to screen as we are screening it without the use of Digital Projection. 4. A print that we had confirmed previously fails to get delivered on time. The Call of Cthulhu is a good example as it never had any film prints struck. That particular movie can only be screened digitally.